At a recent Capacity Building Seminar in Birmingham, Dr David Knight, Senior Conservation Officer at the Church Buildings Council presented a report on metal theft from churches – you can access his presentation here. The issue is a very live one, and David’s talk highlighted aspects that are both worrying and interesting in equal measure. The problem of metal theft from buildings is a growing one due to the increase of raw commodity prices over the last decade or so, principally from economic growth in China – and this problem does not only affect churches. As well as rising demand there is very limited supply, which will mean that we will run out of lead within perhaps two generations. And many sorts of buildings are affected, not just churches – in general, however, it is historic buildings that are the principal victims of this crime. Regulation of scrapyards: The aim of this is to remove easy access to cash. The proposal is for the government to introduce mandatory licensing for dealing in scrap lead, requiring the recording of registration details of each vehicle entering the yard, and making anonymous sale illegal. The Church Buildings Council has held meetings with the Home Office and has submitted a report which is being actively considered. Alarms – there are various systems, using sound and/or light which have proved a useful deterrent – systems need to require multiple activation, to avoid being set off by a falling leaf. Watermarking – Painting at least a fraction of each metal surface with ‘Smartwater’ provides a forensic marker on the lead which will allow any lead stolen from your building to be traced back. There have been successful prosecutions of thieves by this method; however, this will only stop a theft if you advertise the fact that your material is protected in this way, and if the thieves understand this and believe you. 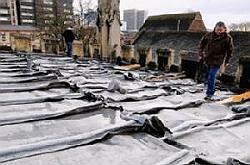 Ecclesiastical Insurance has a web page dedicated to Metal Theft, with an excellent report in pdf form. We must confront the fact that for those that do the thieving, the metal is there for the taking – they are in effect harvesting what they see as a free resource. Replacing that resource like for like without at the very least increasing security along the lines above will simply result in repeated return visits. 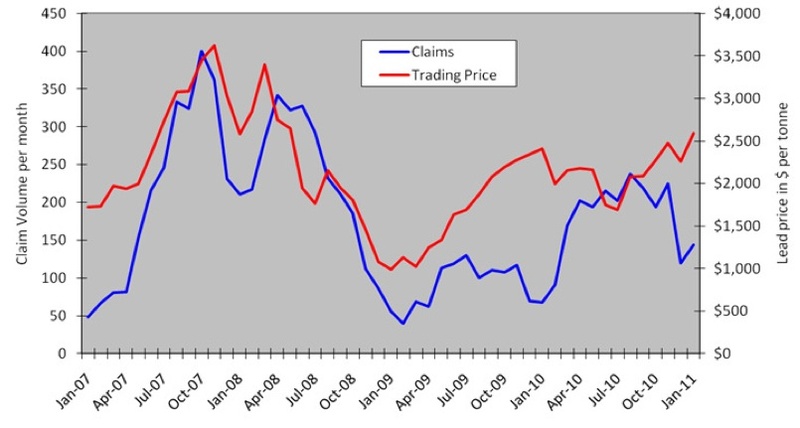 In his talk David also presented the following graph (from Ecclesiastical Insurance), which shows the trading price of metals against the level of insurance claims over a period of 4 years. 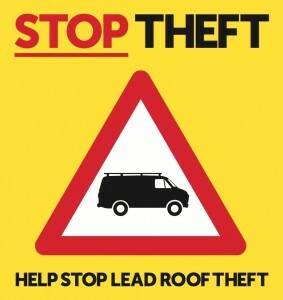 What the graph shows is that metal theft is a planned crime. Ubliflex – a non lead flashing material which can be used in all applications where lead is traditionally installed, such as valley gutters, cover flashings, step flashings etc. Clearly not every historic building is suitable to receive these alternative materials – the choice of materials should follow an understanding of their significance. There is no doubt, however, that previous generations up to and including the Victorians would have taken a pragmatic view of this, and would specify the material that would be best for the building in the long term. If we are to address the significant problem of metal theft from historic buildings then we need to do so from all angles, including taking the heat out of the market by reducing the demand for the ‘product’; until we do so, we leave our historic buildings exposed to increasing abuse. Please let me know your thoughts on this issue.